Which Version is God's Word? Everyone is familiar with the Leaning Tower of Pisa in Italy. 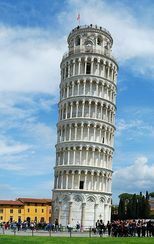 “The tower's tilt began during construction, caused by an inadequate foundation on ground too soft on one side to properly support the structure's weight.”(a) To this day the tilt is continuing and threatens to destroy this building. As of now they are attempting lead counter weights and even excavating out the soil beneath the higher side. However this will only cause the building to sink deeper into the ground but the inadequate foundation will continue to sink even with these efforts. This graphically illustrates to everyone the critical need for a good foundation rooted in solid rock. Without it, whatever is built will not stand. So too must any information about God and his salvation gift to mankind must also be founded in the solid rock of truth. Therefore our foundation, the Bible must be correct and free from error. For if it is not the inerrant and infallible word from the almighty, all powerful God of the universe, what hope do we have in any of the promises written therein. We must ensure that the words and sentences written therein are straight and true as when they first came from the disciples who walked and talked with Jesus. For we must look to where Christianity first started. Some say Christianity started in Jerusalem at Pentacost. Others say it officially started with the church in Rome. But most agree that it was the disciples that started the movement after Jesus ascension on the Mount of Olives after his resurrection from the dead. What does the Bible say? Acts 11:26 (KJV) And the disciples were called Christians first in Antioch. Acts 11:26 (RSVCE) ;and in Antioch the disciples were for the first time called Christians. So obviously since the disciples were in Antioch. Any Biblical writings from Antioch would be most likely have been handed down directly from or approved and checked by the disciples. These were the same disciples who had been closest to Jesus and knew His doctrine. Most likely, these writings would be free of any doctrinal errors as they were from the source itself. So what are the foundations for all the different versions? The original New Testament was written in Greek as the whole known world spoke Greek thanks to Hellenization by the conquering Greeks under Alexander the Great. But as shown above, we would consider manuscripts from Antioch more original and correct since they had the disciples among them constantly check the writings. Various New Testament books were written, copied and circulated amongst the churches. It was not until the mid 15th century that various people set about collecting and combining the manuscripts into one complete Greek New Testament. To date there has been two compilations done. The Textus Receptus uses 5,210 Greek manuscripts from Antioch or traced back to Antioch. Later manuscript discoveries have confirmed the reliablity of the Textus Receptus leading it to be called the Majority Text. The Nestle-Aland Greek Text (Nestle’s Text) uses 5 Greek manuscripts from Alexandria, Egypt but primarily the Vaticanus and the Sinaiticus. These manuscripts not only disagree with the Majority Text but even with each other. This has earned it the title of the Minority Text. Many have tried to justify the newer versions in various ways. The most common argument is that the King James is dated and needs to be updating. However when one takes the time to compare the versions, some glaring differences begin to stand out. Most obvious becomes the Minority Text’s subtle omissions on the need of repentance and belief in Jesus as the only requirement for salvation. 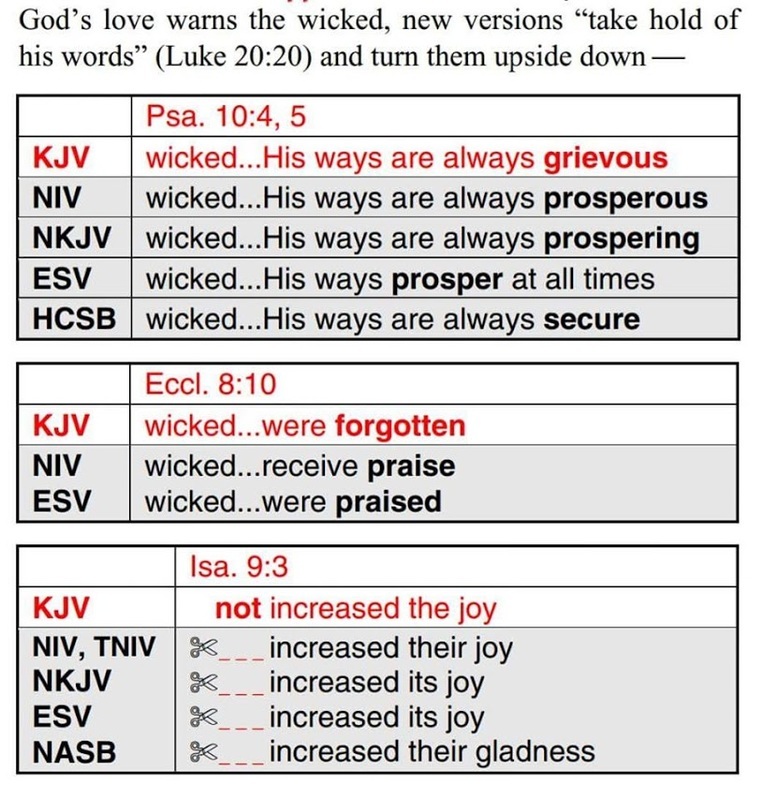 Below I have taken the time to compare the King James Version against versions commonly used . These are by no means a complete list of all the differences between the Majority Text and the Minority Text. Rather they are the most doctrinally striking differences. A common excuse is that missing text like Acts 8:37 were simply not present in the original text and so the Codex Laudianus didn't have them but simply changed the numbering because scribes later added the missing verse. This however doesn't hold water as the Codex Laudianus was used to form the Minority Text. "It contains Acts 8:37, as do the manuscripts 323, 453, 945, 1739, 1891, 2818, and several others." This means theses verses were INTENTIONALLY OMITTED in the Minority Text, as they were present in ALL the ORIGINAL text from Alexandria. The King James Version using the Majority Text all from Antioch where the disciples were present ALL have the verses omitted. With the Majority Text, you know that you have an accurate transcript of what God’s word says. Even when compared to the Dead Sea Scrolls, that were discovered in 1947 and was dated 100 BC, the King James finished in 1611 AD is nearly identical. The only difference found were minor grammatical differences that did not change the meaning of the passages. That way, God’s word stays true and unchanged like a firm unchanging foundation under any building. 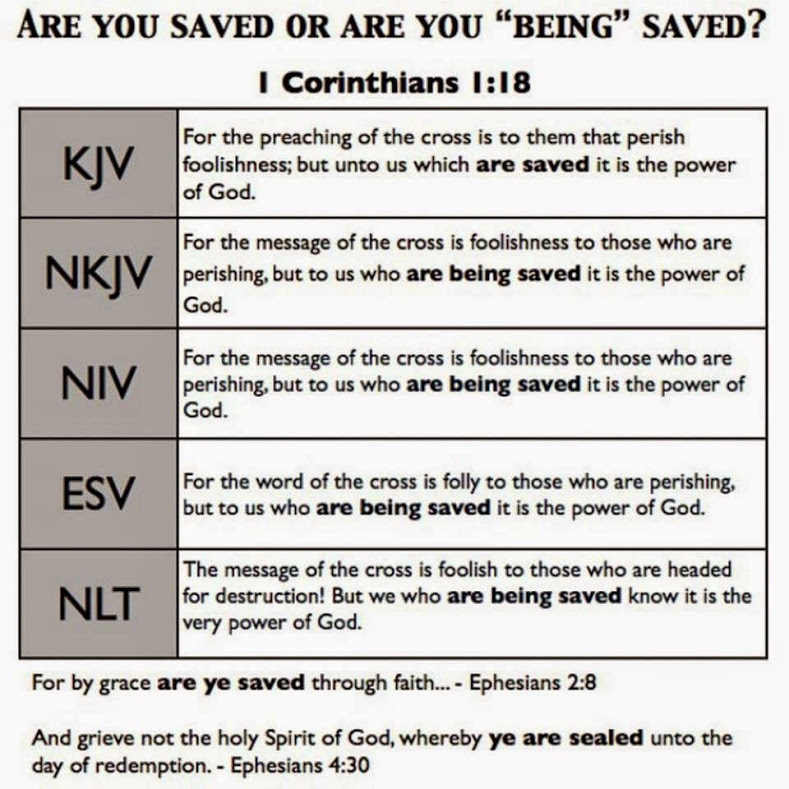 So when the Bible says you will be saved by believing in Jesus only, you can trust that is all that is needed to get into heaven because it was straight from the mouth of God himself (aka Jesus Christ). 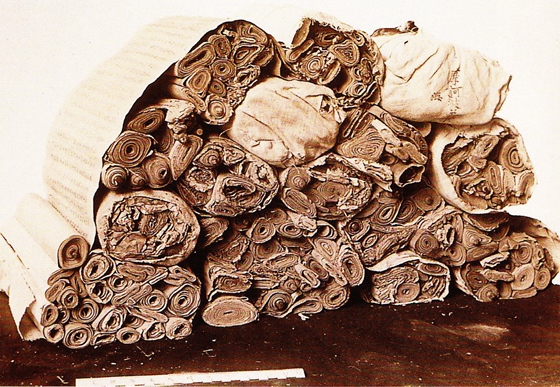 ​The Dead Sea Scrolls were found in the Wadi Qumran, 1946 and 1956 by Bedouin shepherds and a team of archeologists. They date to 3rd century BC and is confirmed by bronze coins and radiocarbon dating. This is 300 BC - 201 BC. Well before anyone could corrupt the Bible. 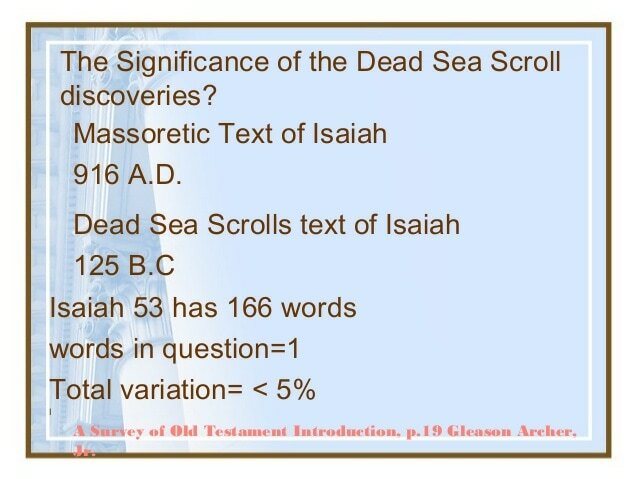 Among the Scroll fragments was found a COMPLETE scroll of the WHOLE BOOK of Isaiah. When this was compared to the Isaiah of the KJV, it was a 99.9% match. It is now housed in Jerusalem at the Shrine of the Book at the Israel Museum. 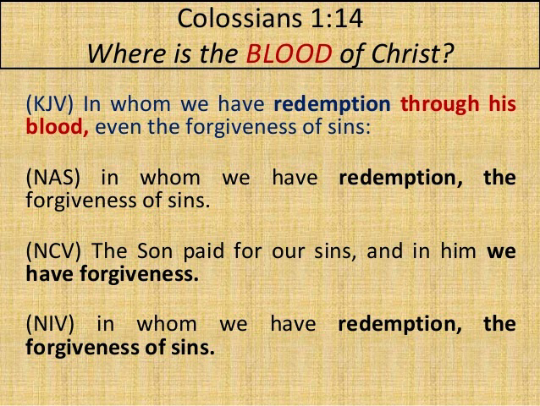 Therefore there is NO CORRUPTION of the original Hebrew text at all. The text is UNCHANGED, even with the Bible we have today, from the text in Hebrew 2300 yrs ago.